Hey Parents: Have You Seen Your Child's New Bible? 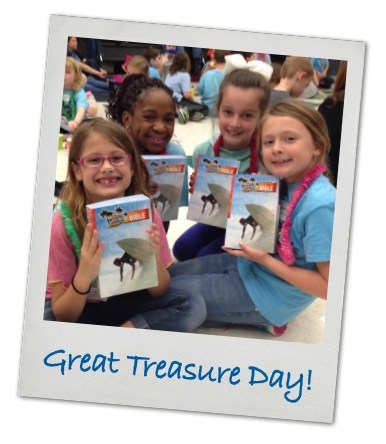 We just finished celebrating Great Treasure Day, the day in Beach Club that your child received a KiDs Beach Club® Explorer’s Study Bible.Thanks to our generous donors, more than 7,429 copies of God’s Word have been handed out this fall to every child in every one of our clubs at no cost to our partnering churches or the students. We hope you are enjoying the excitement of exploring the treasure of God’s Word along with your child. Great Treasure Day isn’t just a one-time event. With thousands of new kids coming into Beach Club every year, we will be giving a Bible to each one of them, just like we did for your child. Would you please consider passing this blessing forward? Join us by setting up a monthly recurring gift of any amount or give a one-time gift of $40 or more and we will send you a FREE KBC T-SHIRT. This special offer expires December 31, 2015, so give your gift today to support Bibles for Beach Club! With KiDs Beach Club® being an IRS qualified 501(c)(3) non-profit organization, all donations are tax deductible. Hurry and beat the deadline for this year.